If you are not able to go to the church and join the liturgies and masses during the Holy Week and Easter, you might want to consider going online? RegaloService.com has found an online Lent and Easter retreat that can help you do some reflection during the Lenten Season. 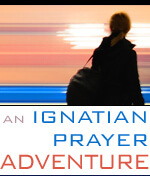 Checkout Loyola Press’ Ignatian Prayer Adventure. What’s good about this site is you can allot a time for the Lord anytime and anywhere you are because you can read it using your computer, laptop, mobile phone or tablet. Have a blessed Lenten season!